In celebration of the paperback release of ROGUE COUNTESS and the eBook release of RECKLESS VISCOUNT (both coming June 4th!) I am posting a deleted scene. What follows below was originally intended as the opening chapter to ROGUE COUNTESS. Unfortunately, as I discovered when people started reading the manuscript, Leif, as he is wont to do, claimed far too much attention. I ended up cutting the scene completely, promising Leif a story of his own if he would be willing to step back so Anna and Jude could take center stage. 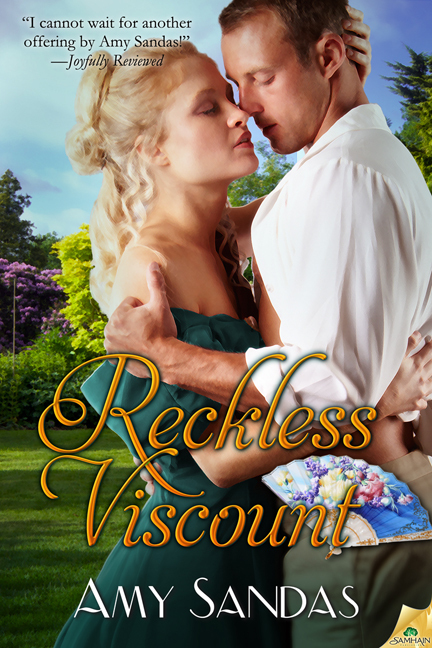 Since he has proven to be a favorite among readers, I thought I would give a glimpse into the moment when I first met the scoundrel who is finally the hero of his own book, RECKLESS VISCOUNT. The Right Honorable Lord Riley, sole heir to an ancient and impoverished title and devoted lover of wealthy women, needed a drink. He had started out from London on horseback late the night before after a two-day binge of drinking, gambling and debauchery. His intoxication and fervent devotion to his mission had sustained him for the first leg of his journey. But after a few hours of bouncing drunkenly in the saddle, he had begun to seriously question his mad-dash decision to ride out for Suffolk. He cast a glare of reproach at the persistently rising sun. Most people would have been awed by the majestic blend of gold, pink and orange that stretched across the sky. But Leif was sobering up. If he had not been quite so foxed when he overheard the tid-bit of gossip that had sent him rushing from his club, he might have realized that this particular news could have waited a few hours, or a lifetime. If he had gone in search of his bed instead of a horse, he would at least have been able to deliver his message with a clear head and a more subtle approach. He licked his dry lips, dug his heels into his tiring mount and made a heartfelt vow that he would soon reward himself with a strong Irish whiskey and the welcoming comfort of a featherbed. With a rueful smile, Leif turned onto the private drive that led to Thornwood Abby. Even knowing how necessary it was that he deliver the distasteful news, the further Leif progressed down the oak-lined drive, the more he wanted to turn his horse back toward London. To his credit, he resisted his cowardly tendencies and kept to his course. A moment later, the large Elizabethan home came into view. Rather than riding up to the front door, Leif turned down a side lane that curved into a surrounding copse of trees and emerged in the wide-open yard of the fully renovated and modernized stables. The lady he sought would be found no where else but with her horses at this ungodly time of day. At a distance, the young woman occupied with the task of brushing down a magnificent Thoroughbred could have passed for one of the stable lads. But even with his eyes still bleary from liquor and lack of sleep, Leif recognized the lovely curve of a lady’s arse quickly enough. Anna turned at the sound of his approach. She tossed her thick black braid over her shoulder and lifted her hand encased in a glove of tough rawhide to swipe at her damp brow. Along with fitted breeches, she wore black Wellington boots coated with muck from the training yard, and a man’s white linen shirt, rolled up at the sleeves and unbuttoned at the throat. Warm brown eyes surrounded by a thick fringe of lashes widened in surprise as she noted his unexpected arrival. The smile of welcome faded from her full lips and the slashing arch of her black brows lowered over her eyes. “You’re foxed,” Anna observed dryly. Anna stepped forward and placed her hand on his mount’s forelock. She looked up at him with an expression that was both resigned and reproachful at the same time. It was a look that made him feel like an unruly younger brother, though he was actually two full months older than she was. He was stalling. He knew it and felt some shame for it. But now that he was here, he hadn’t figured out the best way to spit out the words that were lodged like a chicken bone in his throat. Anna cast him a withering glance that clearly indicated what she thought of his attempt at making her feel guilty for taking him to task. He should have known better than to try to manipulate the feelings of this particular female. Since he had been six years old and had first discovered that he could charm his father’s stingy cook into giving him an extra tart at dinner, Anna had been the only woman who had ever been immune to his skillful and practiced influence. She hadn’t been impressed by his sweet face when they had been small children traipsing about the countryside and certainly wasn’t swayed now, even though Leif had learned a few more tricks of persuasion since becoming a man that he had found to be quite effective. Tricks, which at twenty-four he had polished and perfected to a point that few ladies ever refused him anything. The scowling young woman before him being the one persistent exception. He dropped his reins and slid clumsily from the saddle. Not accustomed to long rides and still feeling the effects of the copious amounts of alcohol he had recently consumed, his legs buckled beneath him when his feet hit the ground. He grasped at the mare’s mane to steady himself and from the corner of his eye he saw Anna bite her lip. Leif hesitated. He wished that his next words could be spoken by a better friend than he, someone more compassionate and less wretchedly useless. The damning words, when he spoke them, were muttered with fierce regret. He could see by the stiffening of her slim back and the sudden stillness of the brush in her hand that she understood. There was only one person that would flash to her mind at his bluntly uttered statement. His heart ached then for the pain his next words were going to cause her. I hope you enjoyed this little introduction. Get to know Leif a lot better in RECKLESS VISCOUNT, available June 4th wherever eBooks are sold!